Summer Scheme “Victoria Square” £100 gift voucher prize draw! As part of our promotion of our summer scheme at R.B.A.I. we are pleased to announced a fantastic PRIZE DRAW which will be held on the 31st May. This is open to any new customers who have booked this year. 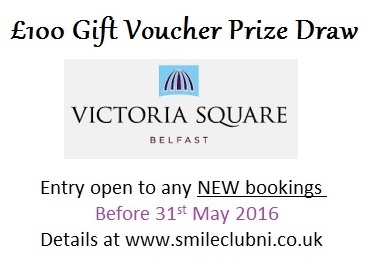 The prize is a gift voucher for the Victoria Square complex in Belfast city centre. The voucher can be used in a range of Shops and Restaurant and is taken everywhere throughout the complex. Good luck! the winner will be announced on the start of June via our facebook page and on the www.smileclubni.co.uk website. The winner will be notified by e-mail or text.